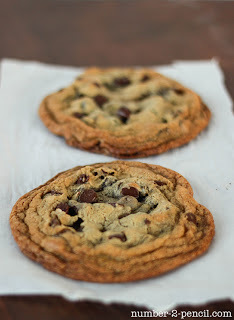 I’m so excited to share this Reese’s Stuffed Chocolate Chip Cookie in a Cup recipe with you! It is seriously ooey-gooey, over the top, chocolatey, peanut buttery goodness. 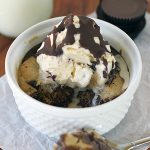 Add a scoop of vanilla ice cream to the top of this deliciously decadent warm cookie in a cup, and you have the most amazing dessert ever made in the microwave. I adapted this recipe from my original Chocolate Chip Cookie in a Cup , and kicked it up a notch by stuffing it with one of my all-time favorites, a Reese’s Peanut Butter Cup. I also added a scoop of vanilla ice cream, which pairs perfectly with this warm, chocolaty cookie in a cup. I used a ramekin for these photos, but this dessert can be made in any microwave safe mug or small bowl. The ultimate single-serving, microwave dessert. 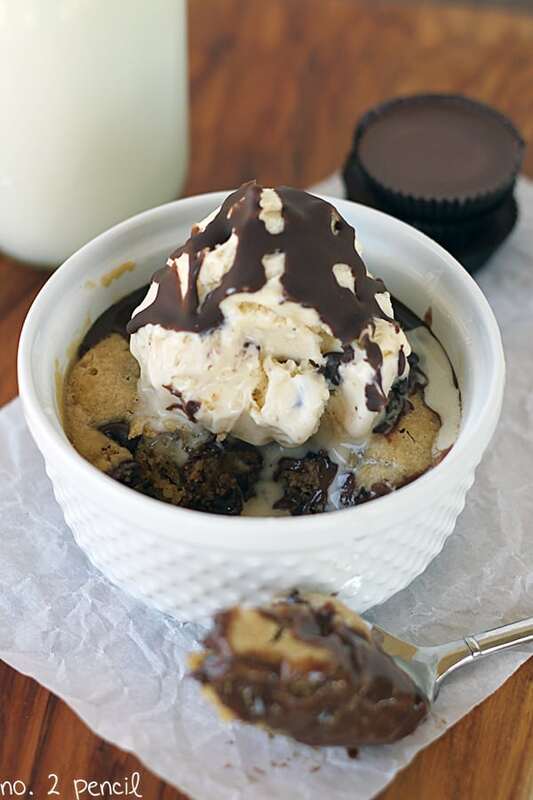 Chocolate chip cookie in a cup stuffed with a peanut butter cup and topped with ice cream. Start by melting your butter in the microwave. Butter should just be melted, not boiling. Add sugars, vanilla and salt. Stir to combine. Separate your egg and add the yolk only to your cup. Stir to combine. Add flour, then stir again. Measure a scant, slightly less than full, 1/4 cup of all-purpose flour. Add the chocolate chips, and give a final stir. Now your mixture will look like cookie dough. Add Reese's peanut butter cup and press down into dough. Smooth cookie dough over peanut butter cup so it is completely covered. Cook in microwave 40-60 seconds, start checking for doneness at 40 seconds. Mine takes 50 seconds. Do not cook past one minute, just like a regular cookie, this will continue cooking as it cools. If the cookie is dry or cake like, try less time. Serve warm with a scoop of vanilla ice cream on top. 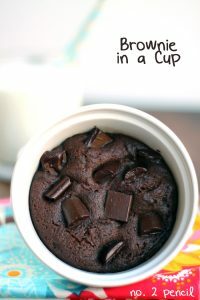 If you need a chocolate fix, try my microwave brownie in a cup. If you don’t want to use the microwave, try my very popular oven baked single serving chocolate chip cookies. 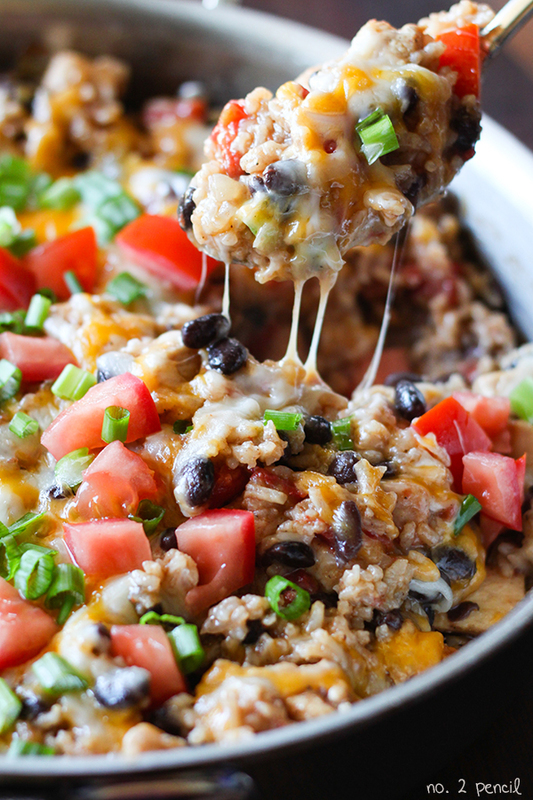 Looks positively mouth-watering, and sooo easy! Yum! This looks so good!!! I can’t wait to give this a try! Made this tonight! SO yummy!